Hinweis: Weitere Informationen finden Sie in unserem Impressum, Abschnitt Datenschutzerklärung. 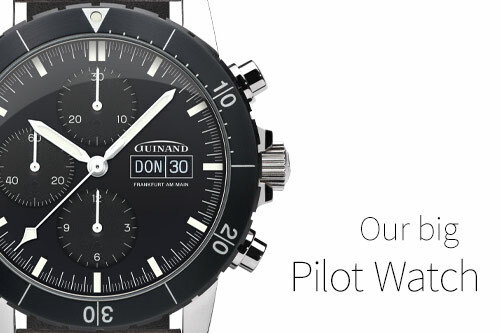 Our Serie 40 is the classic among modern pilot chronographs. Today, as in the past, it is known for its optimum readability, robust design and good wearability. In the cockpit and in everyday life. A classic navigation instrument for daily use on the wrist. Our new solid bracelet is available in January 2019. A classic since 1972, built in the early 80s for a short time and in small numbers with manual wind and Tricompax dial - now finally there is the successor of this design icon as the current Guinand model. Our model 40.50.01 is an instrument - classic design, excellent readability and practicality. This makes this timepice ideal for use in harsh environments on land, on water and in the air. On every continent - and at every rally. 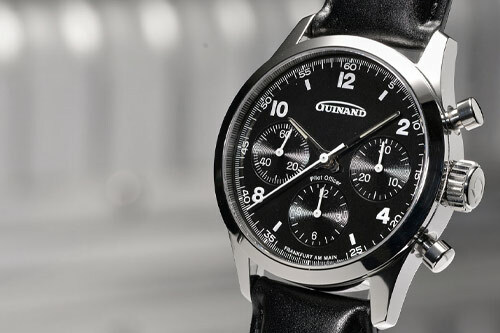 Guinand is a Frankfurt-based watch brand with a tradition that began in Switzerland. Founded 1865 in Switzerland, and established in the mid-1990s in Frankfurt am Main by Helmut Sinn. 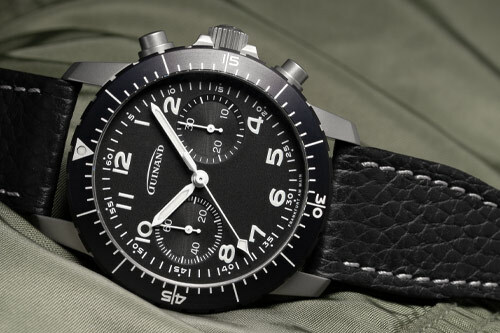 Guinand represents high-quality timepieces that are handcrafted in Germany. The brand is known among watch connoisseurs particularly for its pilot chronographs and instrumental watches. 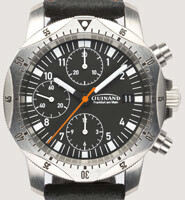 Guinand watches are sold directly to customers by the company’s own sales plant in Frankfurt am Main. who suddenly died at the age of 101 after a short illness died yesterday, Wednesday the 14.02.2018. As a lateral thinker and visionary, Mr. Sinn shaped the development of pilot's watches and chronographs over many decades. He realized his ideas with determination and perseverance and did not hesitate to break new ground. The watch industry owes him many impulses. N: 50º 7' 57" E: 08º 37' 12"
Visit us in Frankfurt/Germany. In our sales plant you can try and buy our watch collections. © Copyrights 2019. Guinand GmbH. All rights reserved.